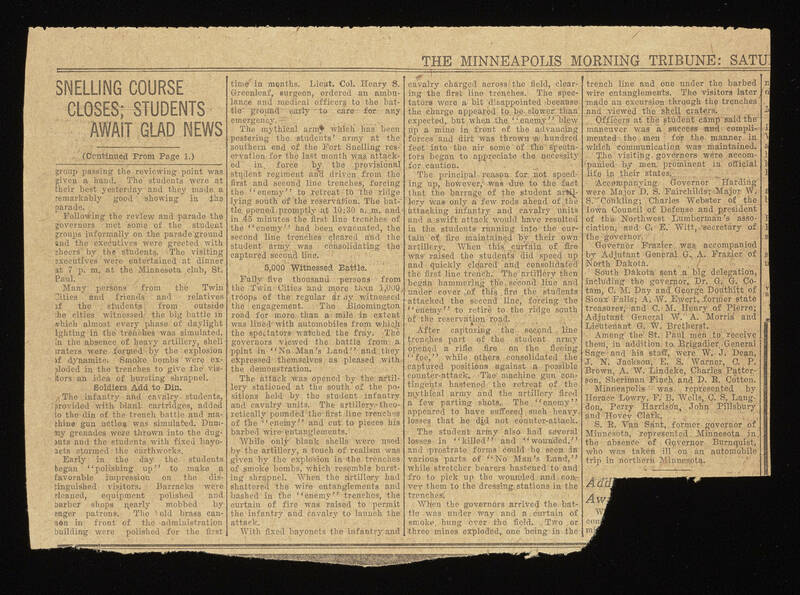 THE MINNEAPOLIS MORNING TRIBUNE: SATU SNELLING COURSE CLOSES; STUDENTS AWAIT GLAD NEWS (Continued From Page 1.) group passing the reviewing point was give a hand. The students were at their best yesterday and they made a remarkably good showing in the parade. Following the review and parade the governors met some of the student groups informally on the parade ground and the executives were entertained at dinner at 7 p.m. at the Minnesota club, St. Paul. Many person from the Twin Cities and friends and relatives os the students from outside the cities witnessed the big battle in which almost every phase of daylight fighting in the trenches was simulated. In the absence of heavy artillery, shell craters were formed by the explosion of dynamite. Smoke bombs were exploded in the trenches to give the visitors an idea of bursting shrapnel. Soldiers Add to Din. The infantry and cavalry students, provided with blank cartridges, added to the din of the trench battle and machine gun action was simulated. Dummy grenades were thrown into the dug-outs and the students with fixed bayonets stormed the earthworks. Early in the day the students began "polishing up" to make a favorable impression on the distinguished visitors. Barracks were cleaned, equipment polished and barber shops nearly mobbed by eager patrons. The old brass cannon in front of the administration building were polished for the first time in months. Lieut. Col. Henry S. Greenleaf, surgeon, ordered an ambulance and medical officers to the battle ground early to care for any emergency. The mythical army which has been pestering the students' army at the southern end of the Fort Snelling reservation for the last month was attacked in force by the provisional student regiment and driven from the first and second line trenches, forcing the "enemy" to retreat to the ridge lying south of the reservation. The battle opened promptly at 10:30 a. m. and in 45 minutes the first line trenches of the "enemy" had been evacuated, the second line trenches cleared and the student army was consolidating the captured second line. 5,000 Witnessed Battle. Fully five thousand persons from the Twin Cities and more than 1,000 troops of the regular army witnessed the engagement. The Bloomington road for more than a mile in extent was lined with automobiles from which the spectators watched the fray. The governors viewed the battle from a point in "No Man's Land" and then expressed themselves as pleased with the demonstration. The attack was opened by the artillery stationed at the south of the positions held by the student infantry and cavalry units. The artillery theoretically pounded the first line trenches of the "enemy" and cut to pieces his barbed wire entanglements. While only blank shells were used by the artillery, a touch of realism was given by the explosion in the trenches of smoke bombs, which resemble bursting shrapnel. When the artillery had shattered the wire entanglements and bashed in the "enemy" trenches, the curtain of fire was raised to permit the infantry and cavalry to launch the attack. With fixed bayonets the infantry and cavalry charged across the field, clearing the first line trenches. The spectators were a bit disappointed because the charge appeared to be slower than expected, but when the "enemy" blew up a mine in front of the advancing forces and dirt was thrown a hundred feet into the air some of the spectators began to appreciate the necessity for caution. The principal reason for not speeding up, however, was due to the fact that the barrage of the student artillery was only a few rods ahead of the attacking infantry and cavalry units and a swift attack would have resulted in the students running into the curtain of fire maintained by their own artillery. When this curtain of fire was raised the students did speed up and quickly cleared and consolidated the first line trench. The artillery then began hammering the second line and under cover of this fire the students attacked the second line, forcing the "enemy" to retire to the ridge south of the reservation road. After capturing the second line trenches part of the student army opened a rifle fire on the fleeing "foe," while others consolidated the captured positions against a possible counter-attack. The machine gun contingents hastened the retreat of the mythical army and the artillery fired a few parting shots. The "enemy" appeared to have suffered such heavy losses that he did not counter-attack. The student army also had several losses in "killed" and "wounded" and prostrate forms could be seen in various parts of "No Man's Land," while stretcher bearers hastened to and fro to pick up the wounded and convey them to the dressing stations in the trenches. When the governors arrived the battle was under way and a curtain of smoke hung over the field. Two or three mines exploded, one being in the trench line and one under the barbed wire entanglements. The visitors later made an excursion through the trenches and viewed the shell craters. Officers at the student camp said the maneuver was a success and complimented the men for the manner in which communication was maintained. The visiting governors were accompanied by men prominent in official life in their states. Accompanying Governor Harding were Major D. S. Fairchilds; Major W. S. Coukling; Charles Webster of the Iowa Council of Defense and president of the Northwest Lumbreman's association, and C. E. Witt, secretary of the governor. Governor Frazier was accompanied by Adjutant General G. A. Frazier of North Dakota. South Dakota sent a big delegation, including the governor, Dr. G. G. Cotam, C. M. Day and George Douthitt of Sioux Falls; A. W. Ewert, former state treasurer, and C. M. Henry of Pierre; Adjutant General W. A. Morris and Lieutenant G. W. Bretherst. Among the St. Paul men to receive them, in addition to Brigadier General Sage and his staff, were W. J. Dean, J. N. Jackson, E. S. Warner, C. P. Brown, A. W. Lindeke, Charles Patterson, Sheriman Finch and D. R. Cotton. Minneapolis was represented by Horace Lowry, F. B Wells, C. S. Langdon, Perry Harrison, John Pillsbury and Hovey Clark. S. R. Van Sant, former governor of Minnesota, represented Minnesota in the absence of Governor Burnquist, who was taken ill on an automobile trip in northern Minnesota.